Scrambled eggs and poached eggs are my DCM’s two favourite ways of having his eggs done for breakfast. I was having one of those mornings where I was feeling a little bleary and hadn’t made breakfast plans. But I had to feed my man. So scrambled eggs it was. I am extremely fussy when it comes to scrambled eggs. Then again, I am extremely fussy when it comes to all food… I like my scrambled eggs creamy, velvety and buttery and not cooked all the way through. There may be those of you who do but I think if you like your eggs well-done, have an omelette. It’s a sin against scrambled eggs to murder them by overcooking. I’ve found the best way to cook scrambled eggs so it’s creamy and velvety, yet not mushy and runny. The only thing as bad as overcooked scrambled eggs is undercooked scrambled eggs. I only use good butter (no oil) and you have to be very careful as you scramble the eggs to make sure they do not overcook. I do not beat the eggs first as that toughens the proteins. This means you do not get that soft, creamy, almost ricotta type texture. When scrambling in the pan, be gently but quick. Also do not salt and pepper your eggs until you serve them. Adding salt draws moisture from raw food. Adding cold full fat milk at the very end slows down the cooking process to ensure eggs do not overcook and creates the velvety effect I love. It takes practise but once you get the hang of it, making perfect scrambled eggs is very easy. See recipe below. Also the best way of cooking bacon is really to just pop it on some baking paper and throw them into the oven (200 degree Celsius, centre rack), Even crisping, there’s no flipping involved and all the fat is rendered without any splattering. When your bacon is almost done, throw in some bread for a bit of a toast. And then voilà! Breakfast is served! In bed or otherwise. I’m generous with my bacon. 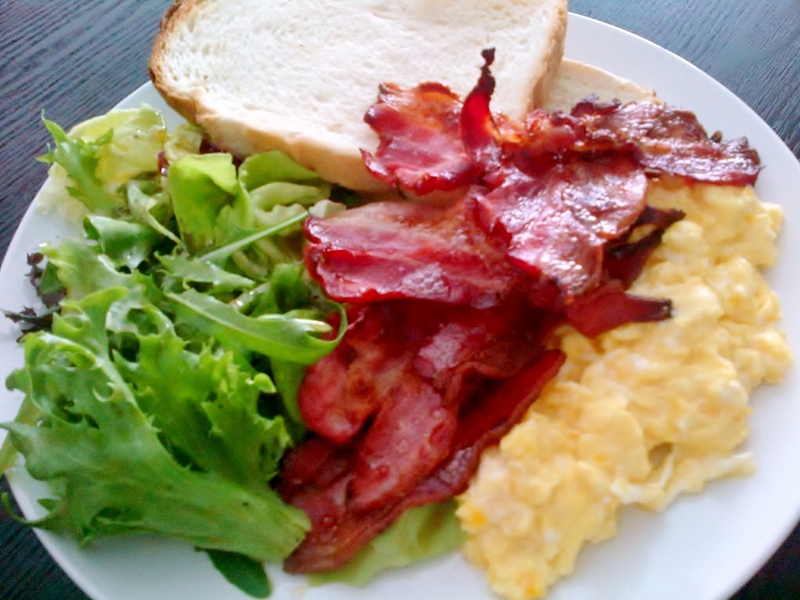 In fact half of my golden mound of perfectly scrambled eggs has been buried under the avalanche that is bacon! Heat non-stick pan over medium-low heat and add butter. Crack all eggs into a bowl. Do not beat. Add eggs to the pan once butter is melted. Do not let butter burn. Scramble eggs in the pan with a wooden spoon. Keep stirring gently until all the eggs are scrambled but still wet. Turn heat to low and be very careful not to let any bit of the eggs overcook. Add cold milk and stir to incorporate. Take pan off heat and stir gently till eggs are set to your desired doneness. Previous Leftover Makeover Next Why Choose When You Can Have Both? Thank you! Anything bacon is good! I agree but when I add butter to mine, it all goes wrong? I even get the electric whisk out lol, and there’s still bits of butter after whisking for about 30mins, anyone know anything please help? 🙂 euugh! and yes I agree to yours, eggs scrambled, not murdered please. Emily, Don’t add butter to the eggs. Gently melt the butter in a non-stick pan over a small flame and pour in gently whisked eggs (sans milk/ cream). Let the eggs set before using a spatula to gently stir them around. When half cooked, pour in a little milk/ cream and gently stir through then turn off the fire and let eggs set a little more before one final stir through.